CANOPY member Lisa Q. Fetterman, founder of Nomiku and formally of Saison's founding team, is serving lunch this Wednesday, April 10th at 12pm! If you are a CANOPY member her Made-in-USA machines are FREE when you make an order on $129 in meals- typically they are $249 at Williams-Sonoma. They will be serving her wildly delicious 72-hour sous vide short ribs and their luxurious vegan rigatoni. 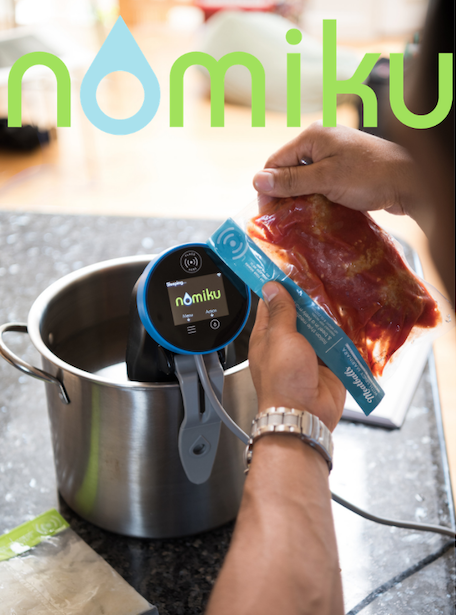 Nomiku is the inventor of the home sous vide immersion circulator and their latest product is like Keurig for the home without being an environmental disaster. Just tap their meals to their sous vide and it's ready for you in 30 minutes. They've partnered with Michelin and James Beard Award winning chefs like Mourad, Nightbird, and Prubechu. We're all in for a treat!